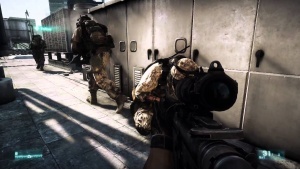 Modern Warfare 3 is a first-person shooter video game much like its predecessors. Modern Warfare 3 for Microsoft Windows has dedicated servers support. The player assumes the role of various characters during the single player campaign, changing perspectives throughout the progression of the story, which, like its predecessors, is divided into three sets of missions called "Acts". Each mission in an act featuring a series of objectives that are displayed on the heads up display, which marks the direction and distance between such objectives and the player. Damage to the player is shown by the visualization of blood-spatter or red-outs on the screen. The player's health regenerates over time as long as the player character avoids taking damage for a limited time. Mission objectives vary in their requirements, ranging from having the player arrive at a particular checkpoint, to eliminating enemies in a specified location, to standing their ground against enemy squadrons, directing remote-operated weapons, and planting explosive charges on enemy installations. The player is also accompanied by fellow soldiers who cannot be issued orders. Like its predecessor, the game includes an interactive scene of a terror attack against civilians, which the player is given the option of skipping due to the portrayal of graphic and potentially upsetting content, including harm to children. Modern Warfare 3 features a new mode, called Survival. This mode allows between one and two players to fight endless waves of enemies, with each wave becoming increasingly difficult. It differs from the Nazi Zombies mode in Call of Duty: World at War, principally in that enemies no longer spawn at fixed locations like the zombies do, but instead appear at tactical positions based on the current location of the player. The mode is available on all multiplayer maps in the game. Players earn in-game cash for items such as weapons, upgrades, ammo, air/ground support and equipment if they kill or assist in killing enemies, while more items can be unlocked by earning XP which is also increased by killing enemies. Special Ops also returns from Modern Warfare 2. These challenge missions feature up to 48 stars, unlike its previous installment, which featured 69. Some weapons in Spec Ops are exclusive to that game mode, and are not available for play in Multiplayer mode. The entire Killstreak reward system has been altered to make it more difficult for players to get early unlocks. Killstreaks are now known as Pointstreaks, and kills are no longer the only way to increase the player's pointstreak. Completing objectives such as planting a bomb or capturing a flag in Capture The Flag awards points towards the player's Pointstreak. Pointstreak rewards are organized into three different "strike packages" called Assault, Support, and Specialist. The Assault strike package works the same as the Killstreak reward system in Modern Warfare 2 and Black Ops: the player must earn more and more points without dying. Once the player is killed, his or her points are reset to zero. Likewise, the Specialist strike package rewards players with perks after every second consecutive kill. Upon death, however, the player loses all the perks and the points are reset to zero. In contrast, the Support strike package are awarded based on the total points that the player has earned over the entire match, regardless of how often the player dies. It is important to note that if a player switches to a custom class with a different reward system (either assault or specialist) during game play, all points are automatically reset to 0. Players are allowed to choose which Pointstreak rewards they want to use when they gain it during the match, rather than choosing them between rounds. Along with revamping the entire Killstreak reward system, Modern Warfare 3 also has a completely modified Ranking and Unlocks system, which does not use a currency system for unlocks. 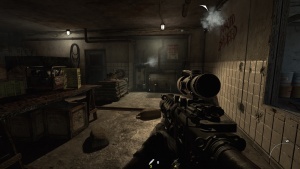 The player's primary weapon levels up alongside the player, and unlocks a number of "Proficiency" perks such as Attachments, (allows two attachments and is a successor to the "Bling" and "Warlord" perks), Kick (reduced recoil while aiming down the player's sight) and Focus (reduced flinching while under fire). Only one Proficiency can be put on a primary weapon. Another new addition is the ability to equip "Hybrid Scopes" on a weapon, such as a Reflex Sight a magnifier similar to an ACOG on the same weapon, and the player can switch between the scopes. Modern Warfare 3 introduces a new "Prestige Shop" which will unlock only after the player has selected the option to prestige for the first time. The "Prestige Shop" allows Prestige players to use tokens they gain from using the Prestige option to buy exclusive features such as double XP and an extra custom weapon class. Kill Confirmed: players must collect floating dog tags from the corpse of a downed enemy before the kill can be registered. However, the opposing team can pick up the dog tag as well to deny the other team a kill, which denies the other team a point. Team Defender: both teams attempt to capture a flag dropped by the first person who is killed when the match starts, the team of the person who holds the flag will get double points for their kills; while the team without the flag only gets the default amount per kill. Private matches also now include pre-made game modes including: "Infected" (where the infected kill enemies to recruit them to their team), "Drop Zone" (where the player must hold a drop zone for points and care packages), "Team Juggernaut" (each team plays alongside an AI Juggernaut character), "Gun Game" (be the first to get one kill with every gun in the game), "One in the Chamber" (in which players are only allowed one pistol with one bullet and three lives where they can only get more bullets by killing other players), and "Juggernaut" (free for all against a juggernaut, kill the juggernaut to become it). Along with this, players are allowed to create their own game modes with customized settings such as number of players and time limit. The Special Ops game mode from Modern Warfare 2 is present in Modern Warfare 3, and includes new features which make it more replayable and similar to other game modes, such as Nazi Zombies from previous Call of Duty games, and Hordes from Gears of War. The two main Special Ops modes include one that is generally the same from the last Modern Warfare game, and a new wave based game, Survival, where the player is inserted into a multiplayer map alone or with a single partner and defends an area against waves of enemies. The players can buy support options unlocked with XP earned during each round. This article uses material from the Wikipedia article Call of Duty: Modern Warfare 3, https://en.wikipedia.org/wiki/Call_of_Duty:_Modern_Warfare_3, which is released under the Creative Commons Attribution-Share-Alike License 3.0, https://creativecommons.org/licenses/by-sa/3.0/.